I will give this people favor in the sight of the Egyptians, and it shall be, when you go, that you shall not go empty-handed. But every woman shall ask of her neighbor, namely, of her who dwells near her house, articles of silver, articles of gold, and clothing; and you shall put them on your sons and on your daughters. So you shall plunder the Egyptians. Does secular literature have any value for a Christian? There are so many good books by Christians–why should we waste our time with anything else? For many Christians, this is a genuine question, and deserves a considered answer. Here it is. First, the apostle Paul himself sets an example of being familiar with pagan literature and using it for the glory of God in the spread of the gospel. In Acts 17:28, he quotes to the Athenians from two pagan Greek poets. “In Him we live and move and have our being,” is from De Oraculis, a work by the 7th century B.C. Cretan poet / philosopher Epimenides, and the following line, “we are also His offspring,” is from The Phenomena, written in the 3rd century B.C. by Aratus. The same line is found in the “Hymn of Zeus” by Cleanthes. Notice that Paul is clear about what he is doing–“as also some of your own poets have said.” In Titus 1:12, he again quotes the De Oraculis, in making a point about the wickedness of certain deceivers, and says in the next verse, “this testimony is true.” Paul’s statement in 1 Timothy 6:10 that the love of money is the root of all kinds of evil is a quotation from a Greek philosopher–Diogenes the Cynic. Some may remember him as the one who went around in broad daylight with a lantern, looking for an honest man. It is important to note that the quotations above were not made by Paul for the purposes of refutation. They were all cited with approval–not of the author, but of the statement. In Acts 26:14, Paul tells Agrippa that Christ’s words to him on the Damascus road were, “It is hard for you to kick against the goads.” The educated Agrippa would have recognized the allusion to the play Agamemnon by Aeschylus, one of the greatest Greek playwrights. The line in the play refers to an old man fighting a losing battle against forces more powerful than he. The Corinthians of Greece would have been familiar with Socrates, and when Paul says in 1 Corinthians 9:16 that “necessity is laid upon me; yes, woe is me if I do not preach the gospel!” they would have recognized the phrase that Socrates used in his Apology where he says he must travel around trying to disprove an oracle that said he was the wisest man; he was spreading the “gospel” of “self-knowledge.” Paul takes that which was familiar to his culture and uses it for the spread of the true gospel. If we jump ahead to the Reformers, we find them following Paul’s example. They were thoroughly versed in secular literature and used it to their great advantage. In Calvin’s Institutes, we observe how willingly he quotes secular authors–Homer, Aristotle, Plato, Galen, Cato, Cicero, Horace, Josephus, Juvenal, Lucretius, Ovid, Plautus, Pliny, Plutarch, Seneca, Suitonius, Virgil. Later, the Puritans were just as thoroughly versed in classical literature. John Rainolds was recognized in his lifetime as one of the most learned men in Elizabethan England. He was one of the instigators of the Hampton Court Conference which led to the King James Version of the Bible, and became one of the principal translators. He was president of Corpus Christi College at Oxford, was Greek Reader in the same college, and lectured on classical authors, notably Aristotle’s book on Rhetoric. He was renowned for his erudition in the classical languages and authors, and for his formidable opposition to the heresies of his day. R.L. Dabney, the great American Southern Presbyterian of the last century, in his work on preaching, cites the classical theoreticians of rhetoric (Aristotle, Cicero, Quintilian, et. al.–pagans all) as examples the student should imitate in order to improve in preaching the gospel. If those who are called philosophers, and especially the Platonists, have said aught that is true and in harmony with our faith, we are not only not to shrink from it, but to claim it for our own use from those who have unlawful possession of it…all branches of heathen learning have not only false and superstitious fancies and heavy burdens of unnecessary toil, which every one of us, when going out under the leadership of Christ from the fellowship of the heathen, ought to abhor and avoid; but they contain also liberal instruction which is better adapted to the use of the truth, and some most excellent precepts of morality; and some truths in regard even to the worship of the One God are found among them…These, therefore, the Christian, when he separates himself in spirit from the miserable fellowship of these men, ought to take away from them, and to devote to their proper use in preaching the gospel. 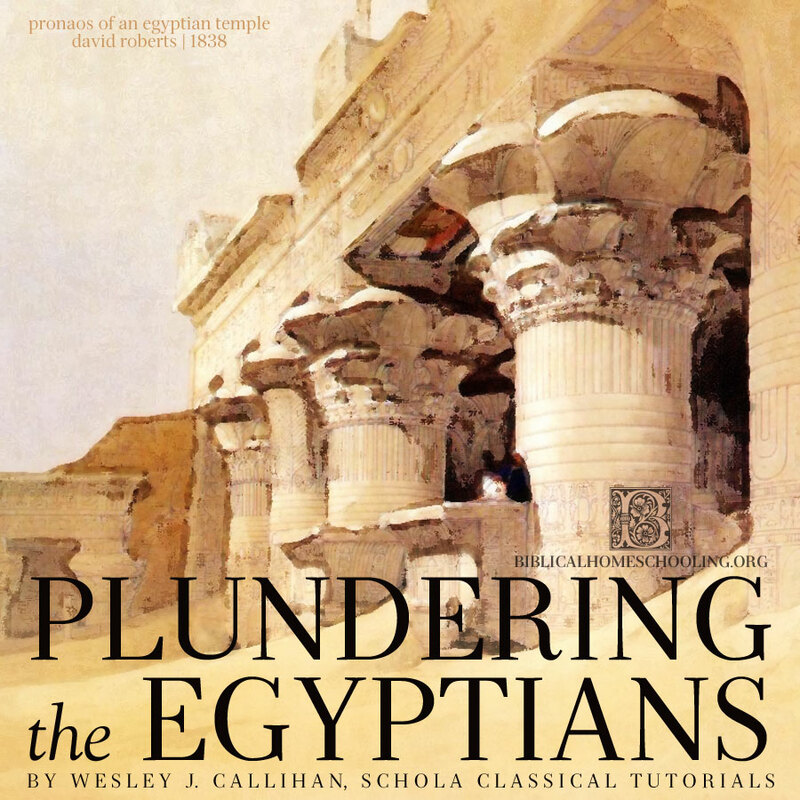 But of course, if we are to join Paul, Augustine, and the Reformers in the work of plundering the Egyptians, we must know where the gold is kept. Copyright © 1998 by Wesley J. Callihan. All rights reserved. No part of this article may be reproduced, in any manner whatsoever, without written permission of the author, except as provided by USA copyright law.